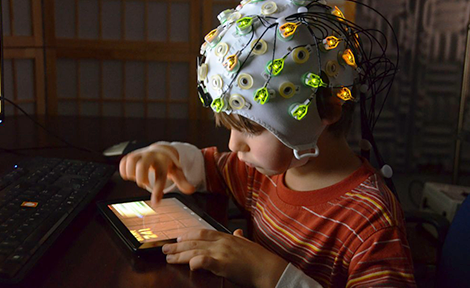 Developmental neuroscientists monitor children's brains to discover the neural markers that predict sharing. Crime Lab New York applies years of objective, analytical research from the UChicago Crime Lab to the nation's largest city. Comparative human development's new chair sees the field expanding in new directions. Rockefeller Memorial Chapel's organ scholar program offers students an opportunity to learn an iconic instrument. Michael Murphy, AB'02, a cofounder of the MASS Design Group, discusses the importance of permanent infrastructure to maintain progress after a health crisis. UChicago philosopher Martha Nussbaum argues for measuring a good life based on "capabilities" rather than an elusive concept of happiness. Among the life-changing innovations cited is neuroscientist Sliman Bensmaia's prosthetic arm that transmits a sensation of touch. UChicago Medicine's Stacy Tessler Lindau, AM'02, director of the Program in Integrative Sexual Medicine, finds that few physicians counsel patients on the subject. Professor Harold Pollack interviews geriatric-care expert and stage IV breast-cancer patient Amy Berman about how she manages her care. Chicago Booth behavioral psychologist Nicholas Epley discusses "parochial altruism," a love for compatriots that can inspire hateful actions against others. Retired Lt. Gen. Daniel Bolger, AM'86, PhD'86, on learning from failures in Iraq and Afghanistan.